Last Sunday evening, the last day of 'SP's Birthday Weekend,' we went to dinner at Eleven, which is one of our favorite restaurants. We enjoy dining at all of the Big Burrito restaurants, but for me, my favorites are Eleven & Casbah. 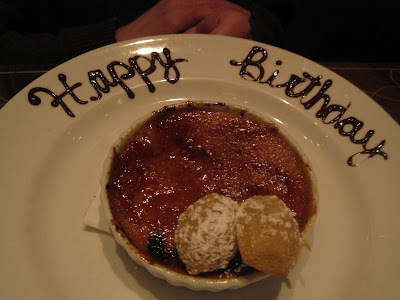 In 2009, we ate at Casbah for both of our birthday dinners so SP decided he wanted his 2010 birthday dinner at Eleven. I mentioned yesterday that we signed up for special offer emails from a restaurant. We did this for the Big Burrito restaurants, too. One benefit: for your birthday, Big Burrito mails you a coupon for a free entree (or $30 off an entree) at one of the six Big Burrito restaurants. It's good from a week before your birthday until a week after BUT not redeemable on Saturdays. So we made reservations for Sunday dinner at Eleven. Happily, it was not snowing and there was not any snow still on the ground. We arrived and were promptly seated in the dining room. I don't know if Sundays are slow, or if it was the weather, or if it was the USA-Canada Olympic hockey game, or if it was that we decided to go at 5:30, but there were only a few other tables occupied. We were seated 'in the middle' of the the other dining parties (as opposed to right next to another party when there were many unoccupied tables). It almost made you feel like it was a private dining experience! This being our romantic, just the two of us birthday dinner celebration, we of course ordered wine. I chose a glass of 2007 Jax Vineyards Y3 Sauvignon Blanc and SP chose a glass of 2005 Navarro Correas Collecion Privada Bordeaux-Style Blend - both were listed on the Featured Wines list on the menu, not in the wine menu book. My sauvignon blanc was less fruity and light than I expect from a sauvignon blanc, but it was still very good. I really liked SP's Bordeaux-Style blend. I'm not remembering any more specifics, like a hint of blackberry or anything, just that they both were very good. And that I sort of wished I'd ordered the Bordeaux instead...! All 3 were delicious - personal tastes would determine the best here. For me, the focaccia was the tastiest. For SP, the raisin-molasses was. 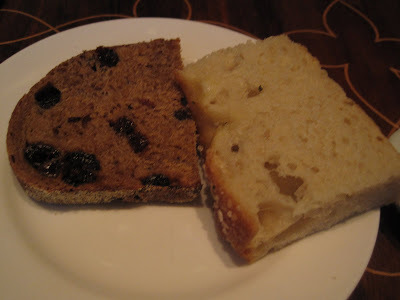 But if Eleven offered me a free loaf of the semolina I would not turn it down because it was very tasty, too! 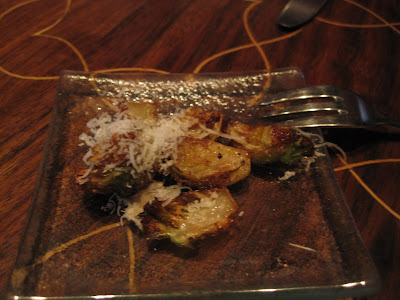 Shortly after starting to munch on our bread, we received a tiny plate, compliments of the chef, of Brussels sprout leaves, grated Parmesan, vinegar, and some other ingredients I forget. It was very tasty. Kind of hard to really see the food in the photo. I did take Elf since it is the size of my cell phone (small) and Elf takes better photos BUT I refuse to use a flash in a restaurant to take photos of my food. It distracts other diners and calls attention to me. I have discovered that Elf takes pretty good photos indoors with the flash off, but in the low lighting of Eleven, the photos are still a bit dark. At least with Elf the photos aren't as grainy and blurry as with the cell phone camera. We decided to share an appetizer: Shrimp & Grits. The shrimp & grits are served with bacon, braised greens, scallion-lager sauce. Our server knew we were sharing, so we each received our own plate of 2 shrimp on a bed of grits with bacon, braised greens, and the sauce ringing it all. Delicious! 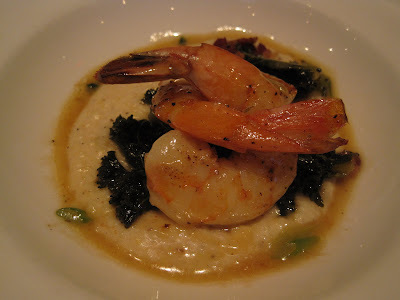 I'm not a huge fan of braised greens, but when eaten with the shrimp & grits and sauce they were delicious. These were a nice sized shrimp, too - not teeny weeny ones! SP and I also commented to each other on how at a place like Eleven, shrimp and scallops are cooked just right. Often, at restaurants, we find our shrimp/scallops to be cooked a bit too much. And, when we cook them at home, because of my sensitive stomach, we tend to overcook them a bit to make sure they are cooked enough for me. But at Eleven, they are cooked just right, which means that some of the best shrimp & scallops I've had in Pittsburgh have been at Eleven. The first time we went to Eleven, we shared a scallops appetizer that was amazing. That is what I measure all scallops against! Next, we shared a Three Greens Salad: radicchio, arugula, frisee, creamy goat cheese dressing, and roasted sweet peppers. Again, our server divided the salad onto 2 plates so we each had our own plate of salad. The goat cheese dressing was both creamy and warm - so tasty. There was a thin slice of crostini with what tasted like an olive tapenade to me. 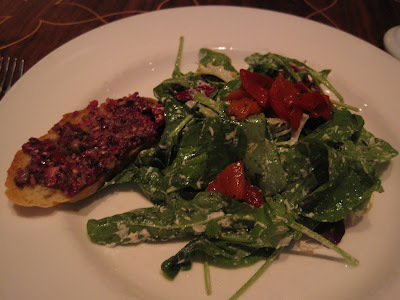 I love olive tapenade so I really enjoyed the crostini. I was hoping to get some extra crostini from SP, but I guess he really liked it, too, because it disappeared rapidly. 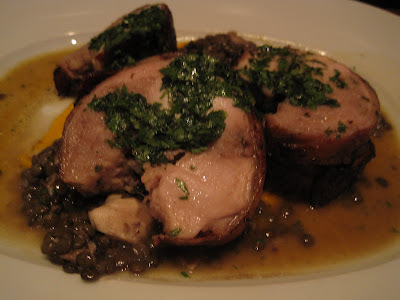 For his meal, SP chose Puckerbrush Farm Rabbit: loin, sausage, braised leg, bacon, lentils, and carrot puree. He loved the carrot puree and lentils, eating all of those. He also really enjoyed the rabbit - there was a very generous portion of rabbit meat on his plate. I tried a bite - my first bite ever of rabbit. I was pleasantly surprised by how mild it tasted. Mostly, I tasted the seasoning. He didn't finish all of the rabbit; he left just a tiny bit uneaten. For my entree, I decided on Elysian Fields Farm Lamb: buttermilk polenta, Brussels sprout leaves, cauliflower, golden raisins, sage, vin cotto. I've mentioned many times before that if I eat garlic, I almost instantly get an upset stomach. 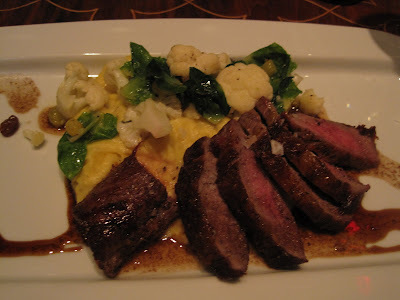 Since the polenta has garlic in it, the chef offered mashed potatoes or grits as a substitute. I thought about grits, but since I haven't eaten a lot of grits in my life, I opted for the mashed potatoes. I also ordered my lamb medium-well instead of the chef recommended medium-rare, but again, that's because my sensitive stomach cannot handle redder meats. I think steaks and lamb taste better rarer, but my stomach demands well done. The lamb was delicious. I was again pleasantly surprised by how tasty the Brussels sprout leaves were. The vin cotto sauce was delicious - I mopped up all of it with my lamb and potatoes! I sort of wish I had chosen the grits over the mashed potatoes, especially since the grits appetizer was so tasty, but... oh well! Splitting the appetizer & salad ensured that we had room for dessert, which to me is usually the best part of a meal! There's just no way I could eat an entire appetizer and salad myself and still have room for dessert. Plus, this way, we both get to sample several dishes. We each ordered coffee and sipped while looking at the dessert menu. A few months ago the newspaper ran an article about how sometimes coffee is an after-thought at restaurants, even very good, pricey ones, and since I am not a coffee connoisseur I can't say much other than it seems to me that Eleven gets the coffee right, too - it had a nice flavor, was hot, and tasted fresh to me!!! I had 2-3 cups of it. SP decided on the Butterscotch Creme Brulee with Brown Butter Madeleines. The butterscotch creme brulee was very tasty. A nice crisp sugar crust. The mini madeleines were adorable and tasty. 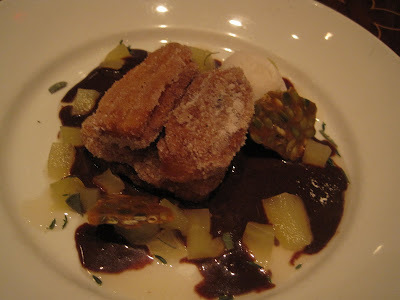 I got the Cinnamon Churros: Mexican chocolate fondue, apple, agave, pepita brittle, horchata sherbet. Our server explained that the churros take a bit of extra time since they are made/fried when the order is placed, not ahead of time, and that was fine with us. More time to sip and enjoy coffee while recovering from all the rabbit/lamb. Oh my gosh the churros were delicious. Warm, sprinkled with sugar, nestled in chocolate sauce - soooo tasty. I gave SP the pepita brittle since I am not a fan of brittle. The sherbet was OK. I didn't know what horchata is, so I looked it up today. Horchata is the name for several kinds of traditional beverages made of ground almonds, sesame seeds, rice, barley, or tigernuts. I saw some sites that said lime or cinnamon is also used. I didn't taste any lime or cinnamon in the sherbet, and it didn't taste almondy. I didn't eat it all. The 4 mini churros with the chocolate sauce were filling enough. There's always a little treat from the chef as you are paying the bill. 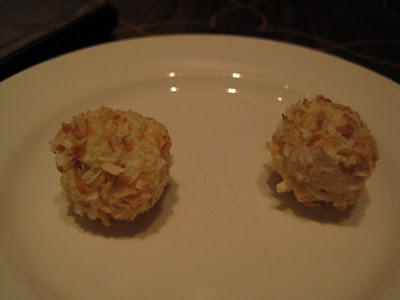 Sunday night it was a white chocolate-pineapple-coconut truffle. I don't really like pineapple or coconut so I let SP eat mine. I didn't want to try the truffle and have it possibly ruin the lovely churro taste in my mouth!!! We lingered for a bit, enjoying some more coffee and the relaxing atmosphere. The restaurant became busier the later it got. We left around 7:30, completely full and feeling good after a delicious, leisurely 2 hour meal! Eleven remains one of our favorite splurge/celebrate restaurants in Pittsburgh. It is easily a $100+ meal, even with the $30 off. We both like the attentive yet non-intrusive service. Plates were cleared promptly, but not before we were done and not right before the next course. Water glasses were kept full. Our server took a lot of time to consult with the chef and with me on the garlic issue. He also did a very nice job, without being asked, of bringing the appetizer & salad split on plates for each of us (instead of me scooping salad onto my bread plate, which I've done at other places!). The bread server did a very nice job of checking back in to see if we wanted more bread. They all suddenly appear so there's no feeling of being watched or people lurking around, and when they do suddenly appear, it's not startling because they all have a calm demeanor (not like some places where servers can be surly or hassled or quickly dart in and out of your 'space'). I'm already looking forward to our next visit! I'm also a big fan of the Burrito. I'd say Eleven is my fave for a meal and Soba for drinks and apps. I'm glad you had a lovely dinner. That lamb looks great! Ooo... now I'm hungry!